Valencia CF match against Sporting ended in a draw, but it was a tough and competitive match where no matter that Valencia CF had a ton of possession it couldn't really do much in front of Sporting goal. This leaves Valencia CF at 3 points ahead of Villarreal and basically every VCF fan will be hoping they loose, so Valencia CF can stay 3 points clear of them. Edit: Well I don't know where to start, I guess at the beginning makes sense but its like having no point to start. Anyways lets just say that Valencia had all the possession they wanted from the start, as Gijon were more than happy to just sit back and defend. Sporting Gijon formation was essentially this: 5-3-1-1, with the most forward player still playing deep in his own half, in other words its as defensive as it gets, 10 players behind the goal, etc... This was of course expected and Valencia CF should have countered it. Now this draw in essense is not that bad, since Barcelona also failed to beat Sporting Gijon at home and in fact they actually chased a draw from 80 minutes, so lets not take away from Gijon great play, and lets not make Valencia players look like the worst players on the planet. Yes there were individual mistakes, missed passes and crosses, bad judgements, but Sporting played really well in defense and against these kind of teams that put 10 men behind the goal its always going to be tough. What I didn't like about this match was that Emery used the same players that played just 4 days ago in a tough champions league match against Schalke 04 and there was another formation used. So Emery played the fatigued players, plus in a different formation. It was obvious Valencia was going to struggle to win, but I was hoping Sporting slip up, some individual genius goal happens or stuff like that. but it wasn't to be. 4-4-2: Guaita; Bruno, Stankevicous, R.Costa, Mathieu; Pablo, Maduro, Banega, Vicente; Jonas, Soldado. First I would replace as much of the players that played against Schalke, this means I would have rested Miguel, Navarro, Joaquin, Topal, Tino, Chori and Aduriz. You can make a case about resting Mathieu also, but he did not play the match before the champions league, so I expect him to be fitter. The other thing is that I would fall back to our familiar 4-4-2 formation, this allows the players to play comfortably as they are used to it and we also have 2 strikers up front, which means we have better penetration in the Sporting penalty area. That is about how I would play, but lets return to the match and wrap this up. In essense Valencia CF had 70% possession, but can only manage several shots off target and only 2 shots on target in the whole match. There were also 4-5 chances, that weren't even very dangerous, but we'll still cont them. 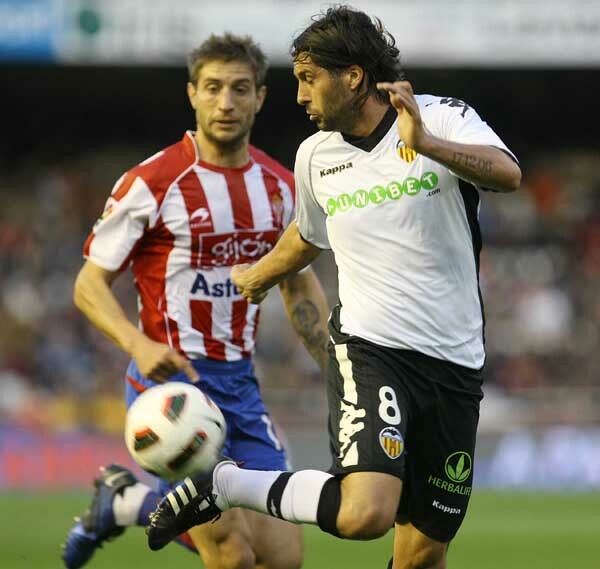 Sporting Gijon defense did great, Valencia players did somewhat poorly and you have the final result of 0-0. Valencia CF (0): Guaita; Miguel, Stankevicius, R. Costa, Mathieu; Topal, T. Costa; Joaquín, Domínguez (Soldado, min. 54), Mata (Pablo Hernández, min. 70); Aduriz (Jonás, min. 77). Sporting Gijón (0): Cuéllar; Lora, Botía, Iván Hernández, Canella; Eguren; De las cuevas (Novo, min. 82), Cases, André Castro, Diego Castro (José Ángel, min. 89); Sangoy (Bilic, min. 61). Guaita 6 - Did not have much to do, apart from few crosses here and there it was an easy match for Guaita. Miguel 6.5 - Went forward the whole time, linked up well with Topal and anyone in the midfield and had 3 interventions to deny Sporting any opportunity. Stankevicious 6 - Was not really tested, made few tackles though. His crossing was way off in this match. R. Costa 6 - Same as Stankevicous. Mathieu 6 - Worked hard in offense, disposed any threat on his side, no matter how rare that was. Joaquin 5.5 - Failed to provide even one decent cross or one accurate pass, from start his passing and crossing were off and did not improve through the whole match. Had two good runs, but again no final ball. Tino 5.5 - Hard working and full of energy as always but absolutely failed to contribute anything. Mata 5.5 - The most creative player on the field, though spend more time in the middle than on the left wing and reduced Valencia's field of play as Mathieu couldn't attack on his own on the left. Chori 5 - Similar to Mata and Joaquin in that he missed all his crosses, got to bad positions at the bad times and could not assert his influence on the proceedings. Aduriz 3 - This is Aduriz second match he has performed so poorly, either he is fatigued or is totally out of form. Soldado 6 - Added some urgency to the attack and brought much needed pace into attack, but ultimatelly failed to score a goal. Pablo 6 - A little bit better than Mata or Joaquin, but as the English commentator said, he was way too predictable with his moves. Jonas 6 - Probably not enough time, but he did have a good shot at goal after dribbling past two Sporting defenders. Also its his first play for Valencia so lets hope he keeps getting better and hopefully scoring many goals for Valencia.